For consistent high-throughput work, nothing compares with the E4 XLS+ multichannel electronic pipette. Fast loading, ergonomic handling and absolute precision across all channels are Rainin hallmarks. The cushioned joystick selector makes it easy to configure and run protocols. When dispensing multiple aliquots across multiple channels, you'll get consistent volume and identical speed at every step. Automate cycle counting so you can concentrate on other details, and relieve your thumb with options to auto-mix or auto-dispense. It's easy to store settings so you can duplicate an assay later. Designed for use with either hand, the E4 XLS+ fits like a glove is extraordinarily well balanced while pipetting. The carefully shaped fingerhook enables you to relax your grip. Extremely light operating forces and a silicone shock absorber built in to the tip ejector make the E4 a pleasure to work with. On LTS-equipped models, tip ejection force is just 0.6 kg. To accommodate GLP/GMP compliance, the E4 makes it possible to password-protect pipette settings, protocols and service alarms. Service records, cycles and status data are completely tamper proof. 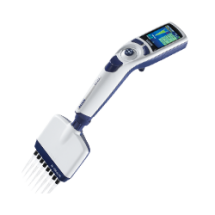 Speed up your plate work with Rainin’s E4 XLS+ electronic multichannel pipettes. Special modes streamline how you transfer multiple aliquots, perform serial dilutions and program complex pipetting routines. Multi-dispense takes the drudgery out of repetitive pipetting by calculating how many aliquots can be dispensed from a single pickup. Autopace simplifies repeat dispensing – click the joystick once and repeat dispense across a plate. Reduce compliance risks! Onboard service data is extremely secure and quick to access. Avoid calibration compliance errors by password protecting access to service interval alarms. Minimize pipetting SOP deviations by locking protocol settings. Purify biomolecules from proteins to oligonucleotides to chromatin using E4 XLS+ adjustable spacer pipettes and Rainin’s PureSpeed™ tips. Unite rapid and gentle processing of multiple samples with high elution concentration for an unbeatable combination! All E4 have the PureSpeed functionality pre-installed.